TDK today announced the successful development of the TDK-Lambda brand RWS-B series of AC-DC power supplies. The lineup comprises four models rated from 100 to 600 watts, featuring simple function design, compact dimensions, and high efficiency to meet a wide range of customer requirements. 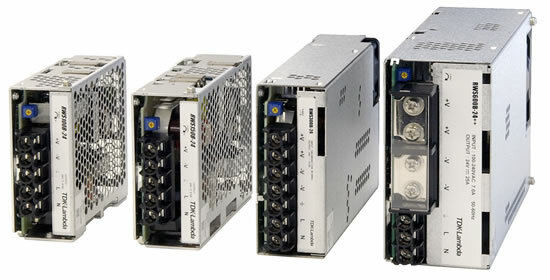 The RWS-B series (100, 150, 300, 600 W) is based on a different concept from existing power supplies. The new simple function type models are designed to deliver solid basic performance with additional functionality optimized with regard to customer requirements and specific applications. The flagship HWS series from TDK-Lambda represents the high end with a full complement of functions, while the RWS-B series is positioned as a mid-range product with simple functionality. By offering the HWS series and RWS-B series in a dual lineup configuration, TDK is able to respond even more flexibly to customers’ needs and requirements. Orders for the product will be accepted by TDK-Lambda Corporation from September 17, 2013.